Saint Angela was born in Foligno, Italy, and lived most of her life in the small Umbrian town of her birth. There was nothing remarkable about Angela's early years, and there was nothing scandalous about her life. Yet she tells us in her later writings that for over thirty years she led a mortally sinful life. Perhaps she was referring to the pride and comfort of a wealthy and fashionable existence, for she came from a family of great property, married well, and afterwards ruled a large household of children and servants. As she describes her conversion, it reads like the story of many a soul today. Fear of her damnation led her to the confessional one day. But she was afraid to tell her most serious sins, and so made a bad confession, then a sacrilegious Communion. Only greater remorse followed. Tormented in soul, she prayed to Saint Francis of Assisi, and he appeared to her in a vision. The next day she made a complete and sincere confession. From this point on, her life was completely changed. The thought of her sins gave her a desire for penance, suffering, and reparation. In Foligno and its neighboring town, Assisi, the memory of Saint Francis, who had died in 1226, was still fresh. It is not surprising, then, that Angela was inspired by Franciscan ideals from the time of her conversion until her death in 1309. 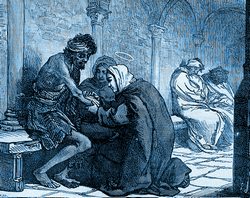 When one by one her mother, her husband and all her children had died, she became a Franciscan tertiary and later lived as a mendicant, a poor beggar, completely dependent upon the charity of others. She was a soul whom God chose to fulfill the role of a mystic. Her confessor recorded from her own lips the visions and ecstasies that were granted to her with startling frequency. For Angela the whole world was filled with God, and she was in almost constant communion with Him. Yet we would misunderstand the interior life of this mystic, or any other, for that matter, if we imagine that her life was without pain, without constant suffering. Angela herself tells us that at times she was overcome with grief because she could see nothing but the extraordinary goodness of God and, in contrast, the vanity of earthly things and the ingratitude of creatures. The sight of a crucifix produced in Saint Angela torrents of tears. The intimacy she enjoyed with God was a grace which at one period of her life was entirely withheld from her, that she might like Job, become a model of constancy amid great and prolonged torments. Of the thousands of tourists who annually visit Assisi and pray at the tombs of Saint Francis and Saint Clare, few travel the short distance to Foligno, where Angela is buried in the Franciscan church. But she, like the Saints of Assisi, has many a lesson for our day. No sinner who would have recourse to her would ever despair. He who is mighty hath done great things to Me, and holy is His Name.